Lanham, Maryland: Scarecrow Press, 2013. 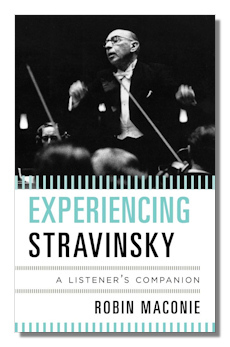 A third distinctive element in Maconie's book is his emphasis on Stravinsky's concern with preserving and disseminating his works technologically, from piano rolls, to acoustic recording through horns (with even violins equipped with special devices to direct their sound into the recording horn), to 78 vinyl recordings, through the LP era including early stereo, not to mention his own performances – and some of Robert Craft's – which have ended upon the CD set mentioned at the outset. With his early pieces, as well as in his ballet music, Stravinsky faced the challenge of composing music at lengths that would fit on records – a concern with film music also. Early recording was done in acoustically dead studios, where the musicians could hear one another with difficulty at best. When Stokowsky recorded Stravinsky's music for Disney's Fantasia, the conductor found the challenge very difficult, because the sections of the orchestra was physically separated for the sale of surround sound. Maconie has an introductory chapter attributing the influence, in his childhood home, of mechanical music boxes on the jerky rhythms on some of his music. This seems highly speculative to me; the reader can take the suggestion for what it might be worth. Writing for general readers, he avoids most technicalities, writing sometimes extended essays that might be suitable as program notes. With respect to the compositions themselves, Maconie tends to stress what the music sounds like. Some of his opinions are such that readers may wish to take issue with. For instance, he says of Fireworks, this is music about bright, spinning and floating objects high in the air, an evocation of light and space…" and refers to a painting by Whistler. He attributes political motives to the composition of Oedipus, Apollo and Persephone, namely a disguised show of defiance toward Nazi propaganda of the time. In a more formal mode, he says of Pulcinella that "the idiom is light years distant from the layered mechanical primitivism of The Rite of Spring…what gives Pulcinella a particularly appealing and poignant charm is a sense of going back to basics….Picasso's flat colors and bold patterns [in Diaghilev's production] became Stravinsky's instrumental colors and rhythms," and the artist's fluid line is matched by the composer's expressively supple treatment of classical melody, an enchanted lyricism new to him…" In connection with The Rake's Progress Maconie discusses Auden's libretto at some length, including reflections on the meanings of the story. When he takes up Stravinsky's later music in a serial style, he shows antipathy toward the opposition of the "powerful Bernstein/Copland axis," more than a bit surprising in view of Copland's use of some serial techniques in his late period. The book is informative, interesting, and sometimes provocative. I have not included any of Maconie's delight in some of Stravinsly's more obscure works, but his remarks on those, as well as the rest, surely make the book worth reading.